The King marched directly North-west to Lancashire, whither Harrison with some of Lamberts men had got before Him, intending to stop His further passage at Warrington; to which service they had obliged and animated the new-raised Cheshire-Foot, amounting to neer 3000; but both they and Harrison received a notable defeat at that place by the conduct of Colonel Massey, who set them a forerunning with a greater speed than they had made hitherto to overtake the King; to whom in this County came the Earl of Derby, who landed at Wye-water from the Isle of Man, though not with the same instantaneous (or indeed any) success, which his great Ancestor the noble Stanly brought to His Majesties Royal Progenitor King Henry the seventh, upon his like dispute, for the regaining of the Crown. 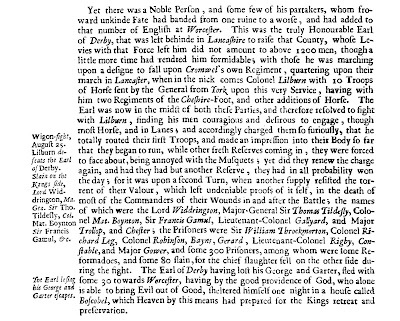 With the Earl of Derby the King left some Forces of English under his Major-General Sir Thomas Tildesly, to strengthen what Forces he brought with him, and to countenance those Levies he was to make in that County, where he was very well beloved, both for his own and his Ancestors worth, and most liberal Hospitality. Massey was left here behind, but presently recalled. Yet there was a Noble Person, and some few of his partakers, whom froward unkinde Fate had banded from one ruine to a worse, and had added to that number of English at Worcester. This was the truly Honourable Earl of Derby, that was left behinde in Lancashire to raise that County, whose Le|vies with that Force left him did not amount to above 1200 men, though a little more time had rendred him formidable; with those he was marching upon a designe to fall upon Cromwel's own Regiment, quartering upon their march in Lancaster, when in the nick comes Colonel Lilburn with 10 Troops of Horse sent by the General from York upon this very Service, having with him two Regiments of the Cheshire-Foot, and other additions of Horse. The Earl was now in the midst of both these Parties, and therefore resolved to fight with Lilburn, finding his men couragious and desirous to engage, though most Horse, and in Lanes, and accordingly charged them so furiously, that he totally routed their first Troops, and made an impression into their Body so far that they began to run, while other fresh Reserves coming in, they were forced to face about, being annoyed with the Musquets; yet did they renew the charge again, and had they had but another Reserve, they had in all probability won the day; for it was upon a second Turn, when another supply resisted the torrent of their Valour, which left undeniable proofs of it self, in the death of most of the Commanders of their Wounds in and after the Battle; the names of which were the Lord Widdrington, Major-General Sir Thomas Tildesly, Colonel Mat. Boyton, Sir Francis Gamul [FN2], Lieutenant-Colonel Gallyard, and Major Trollop, and Chester; the Prisoners were Sir William Throckmorton, Colonel Richard Leg, Colonel Robinson, Bayns, Gerard, Lieutenant-Colonel Rigby, Constable, and Major Gower, and some 300 Prisoners, among whom were some Reformadoes, and some 80 slain, for the chief slaughter fell on the other side during the fight. The Earl of Derby having lost his George and Garter, fled with some 30 towards Worcester, having by the good providence of God, who alone is able to bring Evil out of Good, sheltered himself one night in a house called Boscobel, which Heaven by this means had prepared for the Kings retreat and preservation. 2. 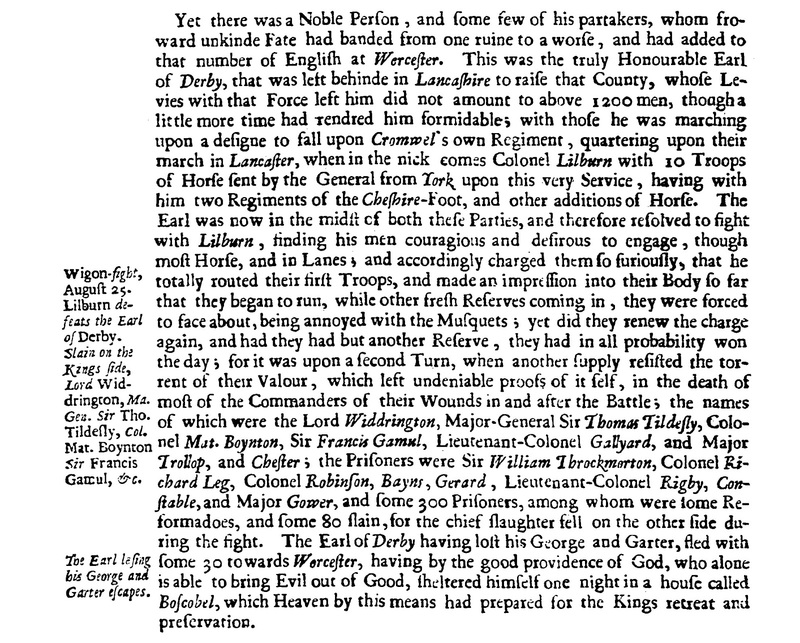 As noted in a previous footnote, Sir Francis Gamul did not die at the Battle of Wigan Lane.